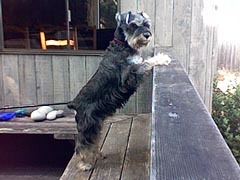 I had adopted Chance, a mini schnauzer, last June 20th, 2009. He and his female cousin had been both placed for adoption and she was adopted a bit before him. They had come from a home in the Alamo/San Ramon area. I wanted whomever had had to give Chance up that he is a wonderful dog, clearly well trained and we have developed an extremely warm, fun loving relationship. He is an extremely people loving dog - he will jump into neighbors' cars as they arrive home, will go into neighbors' homes as if they all are extended family and greets adults and children with an " all out" enthusiasm. While he may bluff bark his head off when we go to Point Isabel, an off leash dog park down by the bay, he quickly stops as he feels more comfortable and is playing more with other dogs when he is not hunting for gophers. He doesn't want to lose me so while he may camp out studying a gopher hole, he will always relent and catch up with me as I keep up the pace as we hike, either down by the bay or in the Berkeley hills. I wanted the family who had to give him up know that he is one big love of a dog and I am thrilled to have him in my life. I had to have two surgeries this past year and was home for all of November/December and from June1st through 8/16/10, when I return to work for the new school year. These times have given us more special time together and Chance discovered that he could bury his bones under me while I slept. He is a character, both full of energy and aware of when to just settle down and snuggle. He is playful, loves certain stuffed animals, loves all people and is learning that other dogs can be safe to be around as well. I had purchased one of those little electronic bird houses that emit a sound for excessive barking and that worked to stop the barking in the backyard etc. almost immediately upon introduction. I feel very fortunate to have him in my life and wanted to let his other family know that not only is he well loved by me, but is a known entity at my work and in the neighborhood, having "dual citizenship" at several households. Thank you SBPR Dog Rescue and the Chance's original family. He continues to have a great life!